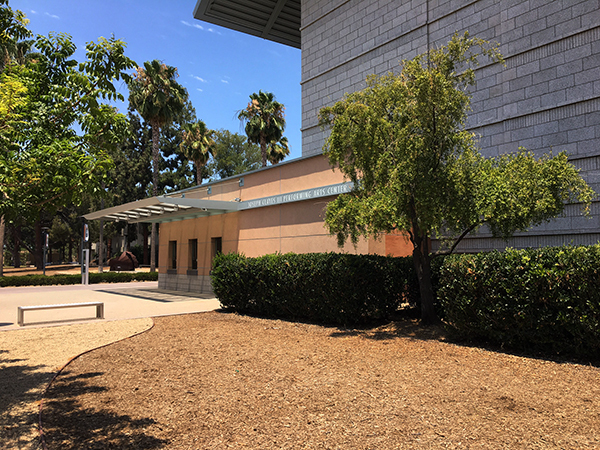 The Dwight Richard Odle Box Office is located at the south-west corner of the Joseph A. W. Clayes III Performing Arts Center (CPAC) adjacent to the Nutwood Parking Structure and accross from the Visual Arts Complex. For your convenience, a limited number of free, 15-minute parking spaces are available near the Box Office at the end of Arts Dr. The Box Office provides tickets for: Meng Concert Hall, Young Theatre, Hallberg Theatre, Little Theatre, Recital Hall and Grand Central Theatre. Cal State Fullerton is committed to providing equal access to all patrons. If you require special accommodations, please contact us two weeks in advance of your visit to ensure your full enjoyment of our performances. Courtesy Shuttle: This service is available for most ticketed performances in the Little Theatre and Recital Hall, originating from the Box Office. Assistive Listening Devices: Infared assistive listening devices are available for Meng Concert Hall, and Young and Hallberg Theatres. Headsets may be used with or without a hearing aid and are distributed free of charge on a first-come, first-served basis. All Student Discount: All high school, college and university students may attend any* music performance for $5 or $8. Tickets must be purchased at the Box Office with valid student I.D. Titan Discount: is available for students, seniors age 62 and older, and Cal State Fullerton staff, faculty, Alumni Association, Osher Lifelong Learning Institute (OLLI) active military and veterans and support group members. Discount not available for fundraising events. All Student Discount: All high school, college and university students may attend any non-musical CSUF theatre/dance performance for $12. Tickets for musicals and opera performances are $22. Tickets must be purchased at the Box Office with valid student I.D. Titan Discount: is available for CSUF students, seniors age 62 and older, and Cal State Fullerton staff, faculty, Alumni Association, Osher Lifelong Learning Institute (OLLI) active military and veterans and support group members. Discount not available for fundraising events. Group Tickets: Groups of 10 or more can receive special discounts for most events. Call the Box Office for price quotes and availability. Discounted tickets are available until 5 p.m. the day of performance (weekend performance tickets must be purchased by 5 p.m. Friday). All Student Discount: All high school, college and university students may attend any non-musical performance for $5. Musicals are $10. Tickets must be purchased at the Box Office with valid student I.D. All sales for Grand Central Theatre performances will be available at the CPAC Box Office until 5pm the day of the show or 5pm on Friday for weekend performances. All sales thereafter must be purchased online .